Want to know just who you will be shopping with when you visit The White Dress? Read along to get to know more about the gals at The White Dress. And because we just love nicknames, we call ourselves, the TWD-ettes. Feel free to call us the bridal dream team if you wish. Kristy has been dreaming of wedding dresses since she was a little girl. Never once did she think she would be lucky enough to be surrounded by their beauty on a daily basis. But after lots of hard work, and a little bit of fate, her dream came true when she opened up The White Dress in 2011. Though she loves all aspects of running her boutique, her favorite part is working with brides. “Seeing the dresses come to life and be loved by another is so rewarding. And making their dream dress a reality is the best!” Kristy’s loves outside of weddings? Puppies, chocolate, and all things pink! Marissa is one of the friendly gals that will greet you when you walk into our lovely boutique. She wears many hats here at TWD, so you can spot her walking around the boutique keeping our little shop in order… as well as behind our front desk checking out TWD clients. And if you have ever called TWD, you have most likely spoken with Marissa as well! She is meticulous not only when it comes to keeping the boutique looking its best, but also keeping things organized behind the scenes as well. Her favorite part about working at TWD? “I love seeing the brides in all the dresses, especially when they have the dress on – they just glow!” Marissa is an avid ballerina (and a good one at that), has a thing for cute shoes, and loves dessert so much, sometimes she skips dinner just for a sweet treat. Ashley is another fabulous TWD-ette and Bridal Style Expert that you will meet when you come to our boutique. Ashley has loved weddings since she was a little girl and has a stack of bridal magazines that will rival any wedding-enthusiast! Her passion for bridal fashion shines through when helping our brides on their wedding dress journey – she has a knack for making everyone around her feels comfortable, especially the bride! And we can bet that by the end of your appointment with Ashley, you will feel like you just had a fun time hanging out with a friend! And that is what Ashley loves best about working at TWD – working with each bride to help find that dream dress by listening to each bride’s likes, dislikes, needs, and wants. Fun fact about Ashley? She adores all animals and is even a foster parent to rescue dogs and cats! If you are looking for someone who was born to be in the bridal industry (really! ), then Annie is your gal! Annie joined the TWD team in 2014, but has been part of the bridal world since she was a little girl when her mother owned a local bridal boutique. She learned at a very young age all the ins and outs of wedding dresses, the various customizations that can be done, and most importantly, just how very special being a bride actually is! Annie is the perfect gal to guide you on your wedding dress journey – she has a vast knowledge of dress silhouettes, fabric types, and is oftentimes using that knowledge to pull the perfect dress for her brides. Her interests outside of TWD include dance, crafting, and hanging out with her husband and sweet baby boy. Meet Katelyn, another member of the TWD Bridal Style Team! Her high energy and love for bridal is apparent from the moment you meet her. “Wedding dress shopping should be fun!” she says. This positive mentality always makes her appointments big on the fun-factor and low on the stress-factor. Her favorite part about working with brides is, of course, that moment when the bride finds the one! “I just love to see the emotion on a bride’s face – whether it is tears of joy or just that lit up bright and excited smile – it makes me feel honored to have been part of such a major moment in her life!” Outside of TWD, Katelyn enjoys spending time with her friends and family, including her young daughter and son. Meet Mary! Mary joined the TWD Bridal Style Team in 2016 with a background in fashion design. Her passion for bridal really shines when she is working one on one with her brides – she has that knowledge of fabrics, silhouettes, and styles. Plus, she has a knack for pulling wedding dresses that are a little outside-of-the-box, but that brides instantly fall in love with! Her patience and friendly nature will make your bridal appointment fun and stress-free! So why does she love working with brides? “Brides are the happiest people and I love making them even happier by creating a wonderful bridal shopping experience. Bringing joy to them just makes me happy!” Besides her love for bridal, Mary is an avid sewer (hello fashion design! ), enjoys volunteering and a good relaxation session in front of the TV. Emily started working at The White Dress in January 2018, but she was at TWD many times prior to her start as a TWD-ette because she is a former #realTWDbride! Emily had her big day in September 2016 and had such fond memories being a bride at TWD that she decided she wanted to make other brides feel just as special as she did. “I just love being able to make a bride’s wedding dress shopping experience fun and enjoyable! I also really enjoy hearing each bride’s story and vision for their dress and their big day – it is amazing to be able to help bring that to life!” Emily’s brides love how great she is at helping them pair down their favorites and her ability to help them think practically about which dress is “the one”…all while having a fun time! Outside of TWD, Emily enjoys hanging out with her family and being outside to enjoy the beauty of nature! Nerissa started working at TWD in the Fall of 2018. 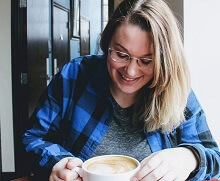 Because this gal has so much love and zest for the wedding industry, she decided to dedicate a few Saturdays a month at TWD, on top of her 40-hour a week “regular” job! She absolutely loves working one-on-one with brides and is great at really listening to their bridal vision. Her brides love her attentiveness and friendly nature, so much so that by the end of the appointment, they truly feel like they have been shopping with a new friend! “Being able to help women pick out their dream dress brings me as much joy as they have for their dress. Knowing that I helped them find a dress that makes them look and feel their absolute best is an indescribable feeling!” In her spare time – when she has it! – Nerissa loves going to concerts and taking barre classes at The Barre Code. Danielle became a TWD-ette in March 2019 but has had bridal in her heart for a long time! She absolutely loves working with brides one-on-one, and has been doing since 2015. So it goes without saying that her extensive experience in the bridal industry is a wonderful asset to any of our brides who come to visit TWD! “I enjoy working at TWD because bridal makes my heart happy. I love being part of such a special moment with brides and their families. When a bride finds her gown, her face just lights up and love is in the air! 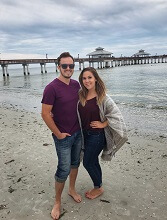 Plus, the atmosphere at TWD is amazing and the team feels like family.” Outside of work, Danielle loves to spend time with her hubby, practice yoga, read countless stories, and travel to new destinations. Meet Haley! She became an official TWD-ette way back in 2016, when she did a short summer internship with the TWD Steam Team. Flash forward to 2018, she officially joined our team a second time, in more of a front and center role – behind our front desk and answering phones! (So that means if you’ve ever called or texted TWD, changes are you have spoken with Haley!) Her bubbly personality makes her a great fit for chatting with all our customers on a daily basis. “I love working at TWD because helping someone get one step closer to finding the dress they’ve always dreamed of makes a work day that much more fulfilling and fun! I also love seeing the excitement on a bride’s face when she comes in ready to find her perfect dress!” Outside of work, Haley loves to read, do any type of art, Pinterest as much as possible, and find unique coffee shops with friends! Meet Hannah! She became an official TWD-ette in June 2018. And – fun fact – she is yet another TWD team member who was an “official TWD bride” before becoming an “official TWD-ette”! Her work behind-the-scenes is vitally important as she is one of our “TWD Steam Queens” and ensures all our client’s dresses look perfectly pressed. Her favorite part about working at TWD? “Helping be a part of the TWD Experience and making each bride’s dress perfect for them! Even though I don’t meet a lot of our customers face-to-face, I love helping their dresses look amazing!” Outside of work, Hannah enjoys hanging out with family and hiking the beautiful outdoors. Though Cathy is Kristy’s mother, she is well qualified for her position. “I even had to interview for it!” she exclaims. Though she has spent many hours working one-on-one with brides, these days she is more involved in all the background action that takes place behind the scenes. Running the “TWD Back Room” is no small feat with all the dresses that come in and out of the shop…and steaming them to perfection is a big job! While she does miss seeing that special moment when a bride (and her mother) light up when they just know that the dress is THE dress, she also appreciates the task of making sure that each bride’s dress is steamed and pressed to perfection for her big day! More about Cathy? She lives for the sun (with sunscreen, of course! ), loves to sew, and enjoys winding down in tub filled with bubbles! Rhiannon started at TWD in late 2018 and is a student at Brighton High School. She is the queen of making our shop look perfect and you will find her tirelessly straightening our dresses and making all of our “things” look great, especially on a busy Saturday. “I love spending my day keeping the shop nice and neat while also getting to see so many brides’ days made when they finally find ‘the one’!” Outside of work and school, Rhiannon is involved behind the scenes for the BHS musicals and plays as well as leading the Marching 200’s color guard. Kassidy joined the TWD team in early 2019 as one of our interns who helps us keep the shop looking clean and orderly. Kassidy is a student at Livingston Christian Schools and will be graduating in June! While she is only here for short periods during the week, we absolutely love her help on busy Saturdays where she helps keep the boutique looking perfect so our customers can see all the dresses on display! “I love working at TWD because it is the place for girls to find their dream dress and I love being a part of that experience!” Though admittedly being a senior doesn’t give her too much free time, when she does have it, she enjoys hanging out with her friends.